We perform ergonomic evaluations for SCS personnel in SCS spaces upon request. We can adjust your desk height, provide you with a better chair, and show you proper body posture and correct chair and monitor adjustments. Our efforts on the ergonomic front will be most effective if you tell us as soon as the pain or discomfort you are feeling first starts. Computer-related repetitive strain injury (RSI) is typically associated with the repetitive motion of typing in conjunction with working in an unchanging position for long periods of time. RSI symptoms may include pain, excessive fatigue, stiffness, and numbness or loss of strength in your hands or arms. RSI can be a serious condition, and if you have symptoms you should see a doctor. The information below is not meant to be a substitute for professional medical advice. Adjust chair height: Your feet should be flat on floor, knees at a 90-degree angle, and thighs are parallel to the floor. Lock chair back: The chair should be locked in an upright position, if possible. 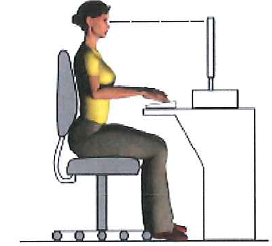 Adjust desk height: Desk should be height adjusted so elbows are at your side, forearms are parallel to the floor and touching the arm rests, and hands are sticking straight out (i.e. wrists not bent upwards or downwards). Position keyboard and mouse: Both input devices should be next to each other, at the same height, and as close to you as possible. Adjust computer screen height: Your screen's top line should be at the same height as your eyes. Adjust distance to screen: Your distance to your screen should be so that your index finger touches it when your hand and arm are straight out in front of you. Center screen: Screens should always be centered relative to your viewing angle. Keep screens at right angles to windows or other strong light sources in your work space. Keep screen vertical: Keep your screen as vertical as possible to minimize glare from overhead lighting. People using laptops cannot make some of these adjustments. If keyboard is at desk height, the laptop’s screen will be too low for comfortable extended use. While in mobile situations this may not be helped, if you have a permanent desk you consistently work at, consider a docking station (or port replicator) with a dedicated screen, keyboard and mouse. SCS Computing Facilities provide standard computer configuration recommendations as well as docking station and accessory solutions that work with these recommended systems. Visit their website for more information. Desks in SCS are height-adjustable and have wrist-friendly front edges. All chairs are adjustable, most in multiple ways. If you do not know how to make these adjustments, please submit a request, and a member of the SCS Building Facilities staff can help. In addition to maintaining the correct postures, it is important to give your body a chance to recover from the stress of typing and mousing. You can do this by taking macro and micro-breaks. Macro-breaks consist of getting up from your workstation and going for a walk, getting a drink from a vending or coffee machine, or chatting with friends or co-workers. These actions should get you away from your keyboard and mouse for a few minutes or longer. Micro-breaks consist of pulling your hands away from the keyboard when you are not typing and away from the mouse when you are not mousing. Even if these breaks last for only a few seconds at a time, they are long enough to allow your wrists and arms to recover from the stress of keeping them in one position while typing and mousing for extended periods of time. SCS Building Facilities stocks wrist rests, foot rests and monitor risers. Submit a request if you need any of these accessories or want us to visit for a consultation.